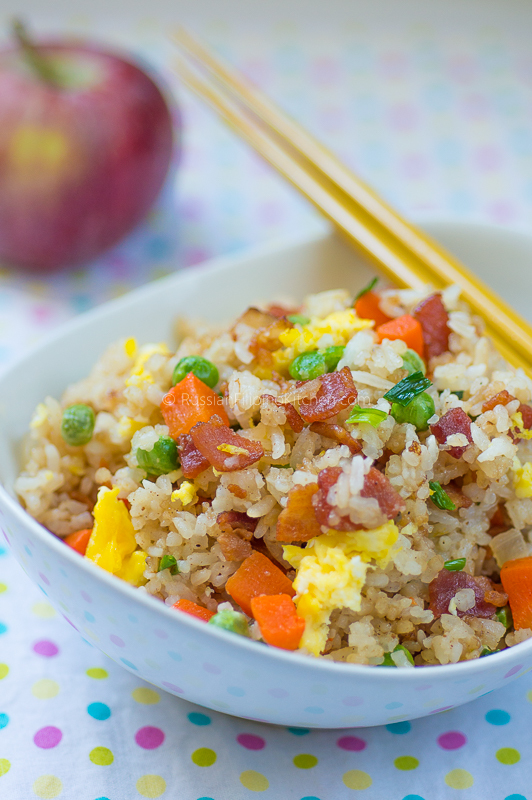 Breakfast has never been easier with this super easy bacon fried rice recipe. 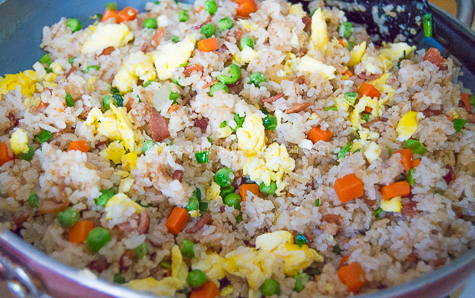 It’s a great way to use leftover rice, and makes a delicious one pot meal for the family. 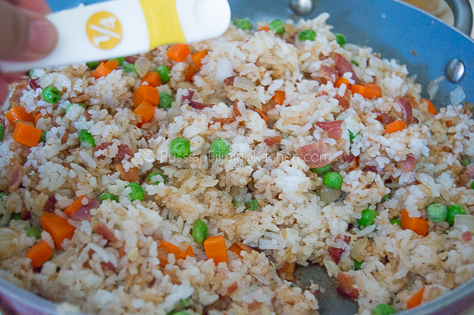 I’m a huge fan of fried rice, be it plain as garlic fried rice (sinangag) or with extra ingredients like meat and veggies. 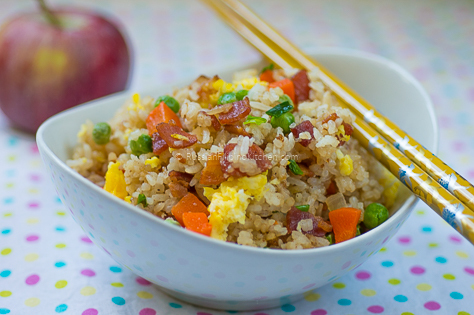 This bacon fried rice is so easy to put together, you don’t have to be a pro in the kitchen. 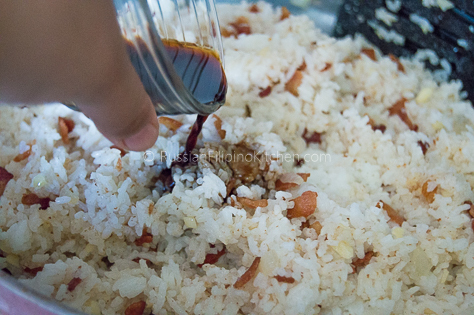 The dish is a tasty combination of flavors from the smokiness of the bacon to the slight nuttiness from sesame oil, and the umami flavor from the soy sauce. This really fills you up, so a bowl will last until your next meal. I hope you give this a try. I promise you will make this over and over again! 1. 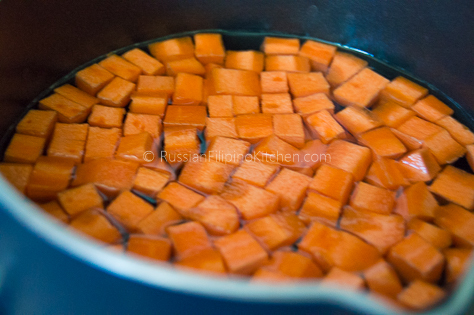 Place carrots in a small skillet or saucepan and add 1 cup water. Bring to a boil. Lower the heat and simmer for 5 minutes or till they’re soft enough to pierce with a fork/tip of a knife. Drain and set aside. 2. 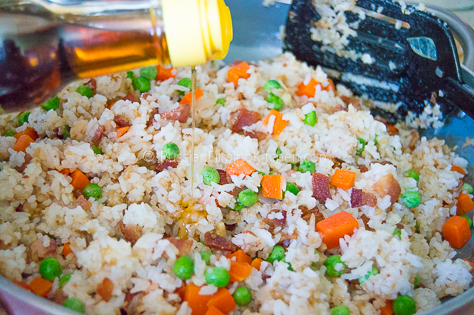 Lightly grease a large skillet or wok with oil. 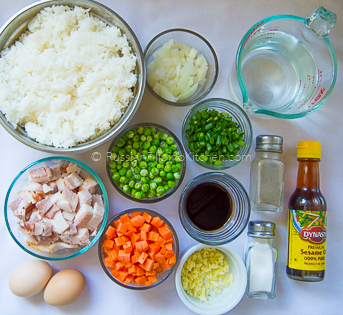 If you use nonstick cookware, you may omit adding the oil. 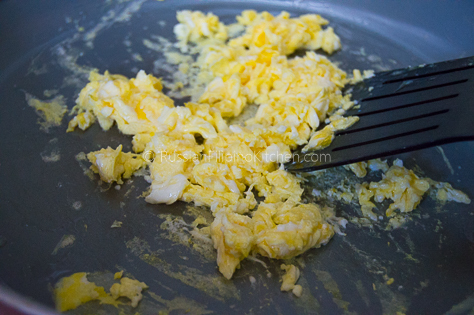 Lightly beat the eggs in a small bowl and fry them till just cooked, about a minute. Remove from pan and set aside. 3. 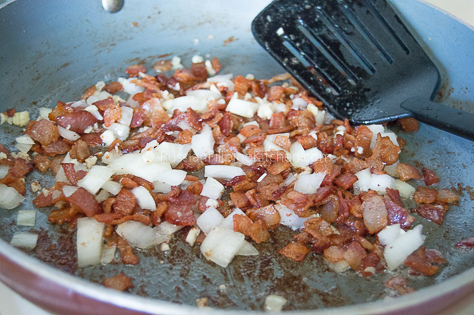 In the same pan where you cook the eggs, add the chopped bacon and fry until golden over medium high heat, about 8-10 minutes. 4. 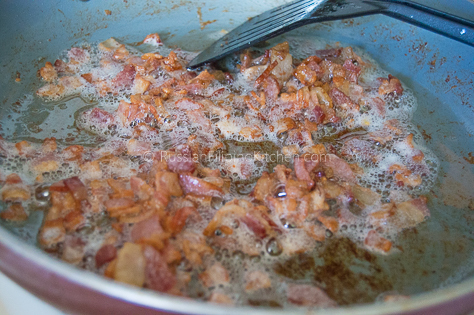 Drain excess oil and leave only about 2 tablespoons of bacon grease. 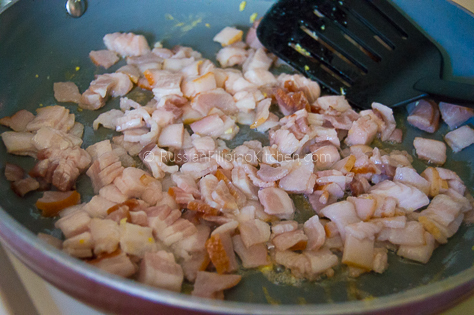 Add onions and garlic and saute until onions are translucent and garlic has browned a little. 5. 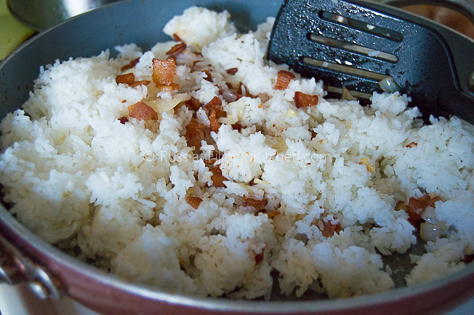 Lower the heat to medium and add the rice, breaking any lumps using the back of the cooking spoon or spatula. Cook until slightly toasted, about 4-5 minutes. 6. 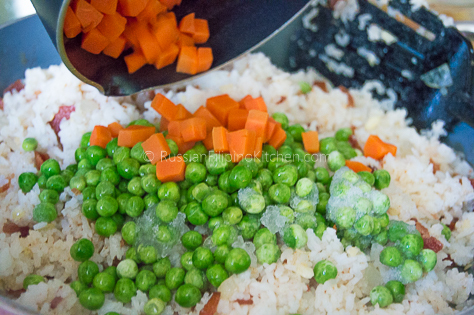 Add the soy sauce, peas, and carrots then mix. 7. Season with sesame oil, salt, and pepper, and cook for 2 more minutes. 8. 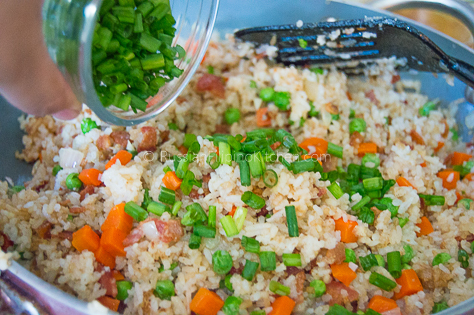 Lastly, add the green onions and eggs and cook for additional minute. 9. Serve immediately.